I love long weekends! This Labor Day could not have come at a more welcome time … work is busy, summer is ending, football is starting, my diet is trying to improve. Sounds like a good time to enjoy three days of no work! I checked out the Lake Worth Playhouse this weekend, courtesy of the awesome husband. 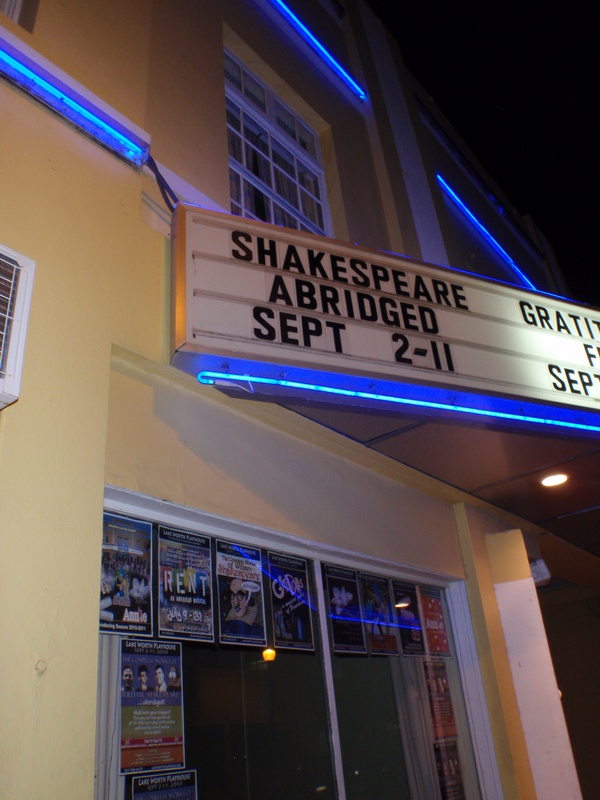 He got us tickets to see “The Complete Works of William Shakespeare … abridged,” and it was great! Three guys, tragedies, comedies and sonnets, oh my! Even for those who aren’t keen on thee’s, thou’s and o’ers, I think the play would be enjoyable. I mean, funny is funny, right?! And it was pretty funny, thanks to the very talented actors, of course. I couldn’t imagine getting up in front of an audience and performing, so I’m always in awe of those that can do it – and do it well! Before the play, we stopped by Little Munich on Lake Ave. I think it could be our ‘spot.’ You know, the place where you know the beer, don’t mind the bartenders and appreciate the (usually) clean bathrooms. Plus, they have good beer on tap and it’s nice and cold in there. We grabbed a beer before the play, then decided to head back after. However, LM is undergoing a transformation in an attempt to attract more people and live music. So, in that case, yaaay! On the other hand, $10 cover to get in. So, boooo!